This sounds great. I’ve been into kale salads since having this amazing one with lots of salty peanuts and sweet bell peppers at Seva Restaurant in Ann Arbor, Michigan. I’ve found several similar recipes on the web. Your recipe sounds intriguing because it is so very different from anything I’ve done. I’m not a real olive connoisseur, though. What kind would you recommend using? I’d love to know about Kelli’s recipes that are similar to the kale salad at Seva–just had it for the first time yesterday. Thank you for this terrific comment, Kelli! 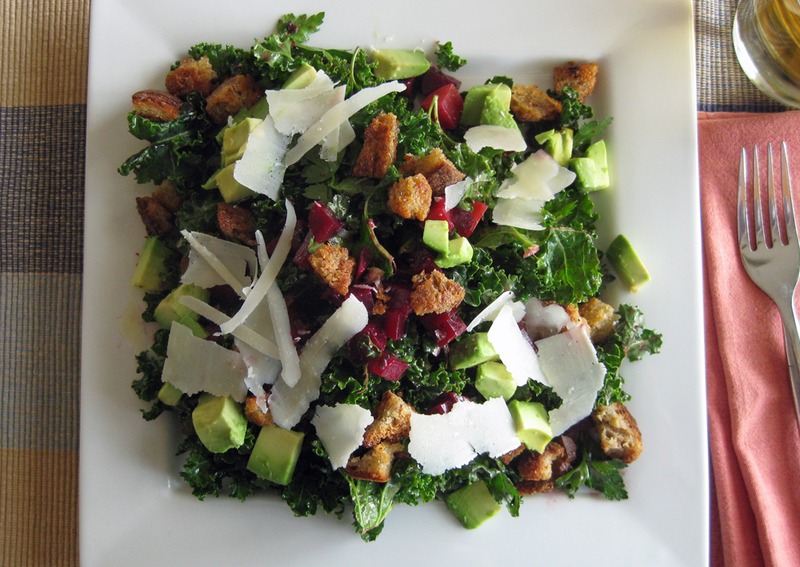 The kale salad you describe sounds delicious. Love the combo of the peppers, peanuts and cider vinaigrette. We’ll give it a try. We used easy-to-find bottled, pitted kalamata olives cured olives with the pits (of course take the pits out) in this recipe. You can find them just about everywhere and at a decent price.